Driving a bus ain’t easy. In just about every city in the world, buses dutifully ferry citizens back and forth like blood being pumped around a circulatory system. They’re always there, always running, always reliable, if rarely on time. But when you don’t need one you don’t think about them at all. They’re just part of the scenery. What I love about simulators is how they give you a glimpse into the lives of people who drive buses, dump garbage, and haul cargo; lives that are, for most people, a mystery. Since playing World of Subways 3: London Underground I’ve never been bothered by a tube delay. Driving those things is hard. Whenever a truck rumbles past me on the street I think of my hours spent in Euro Truck Simulator 2 and I feel like I understand the job, at least on some superficial level. I’m not equating sitting on my arse playing Garbage Truck Simulator for an hour to a hard day’s graft, but you know what I mean. 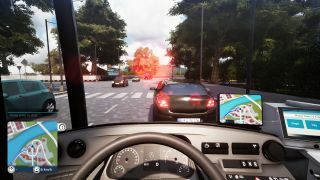 The latest weirdly specific simulator to arrive on PC is Bus Simulator 18, which lets you drive a city bus around a fictional city, picking up passengers, printing out tickets, and making stops on time. I think most people at some point have wondered what it would be like driving a bus, and I found stepping aboard my Mercedes-Benz Citaro K for the first time oddly thrilling—a feeling amplified by the incredibly enthusiastic woman who walks you through the tutorial. For me, simulators don’t get much better than Euro Truck Simulator 2. But as great as it is, it’s a pretty lonely experience. Bus Simulator 18, on the other hand, is full of interaction. Pull up at a stop and dozens of passengers will pile on, some of whom will strike up conversations with each other. Some will ask for a ticket and you’ll have to tap their request into your computer and hand them back the right amount of change. You can even turn around and yell at people, telling them to turn their loud music down or get away from the doors. You can even turn around and yell at people, telling them to turn their loud music down or get away from the doors. The driving itself is fine, if a little twitchy and weightless compared to SCS Software’s satisfyingly nuanced handling. When you’re pulling a heavy load in Euro or American Truck Simulator you can really feel the weight behind you. But in Bus Simulator 18 the sensation of being in command of a big, hefty vehicle isn’t quite there. What I do like, however, is how many buttons there are to press. You can open the front and rear doors, switch on the lights, honk the horn, unfold the wheelchair ramp, adjust the seat, and a dozen other interactions, which make the buses feel wonderfully tactile. The map is fun to drive around, with a nice range of scenery and a good mix of built-up and quiet aras. I would have preferred a real city to a fictional one, though. That familiarity of driving through a real city can really enhance the realism and immersion of a sim. The buses are all real, though, with licensed vehicles from MAN, Mercedes-Benz, IVECO, and Setra to buy, customise, and drive. Yes, you can customise your bus, applying garish paint jobs and decals to make it your own. Sadly there’s no option to add undercar LEDs, spinners, or lowrider hydraulic systems yet, though. Maybe in the next update? Another key difference between Bus Simulator 18 and other sims is how it never gives you a minute to relax. The clock on your GPS is constantly ticking down, and when it hits the minus (indicating that you’re behind schedule) the pressure really begins to mount up. And it doesn’t help that your passengers will comment on the fact that you’re late, complaining when they don’t reach a destination on time. You’re also constantly being graded your driving: using indicators correctly, not hitting the curb, and braking neatly in front of bus stops. Mistakes mean fines, and bad driving will eat into your end-of-route pay. So if you’re looking for a simulator where you can fire it up and just chill out for an hour, play Euro Truck instead. The most intense that game ever gets is being sent down a narrow country road with a wide load or your mind wandering and you missing a turn-off. This game, however, requires a lot of concentration, and throwing people into the mix, some of whom will randomly ask to be let off before a stop, gives you an endless selection of ways to screw up or lose time. The game’s a little sterile visually, and features some really over-the-top lens flare. Are those brake lights radioactive? But the buses, inside and out, are brilliantly detailed. And the audio design is fantastic too, perfectly capturing the noisy clatter of being aboard a bus. There’s Steam Workshop support too, and modders have already started releasing decals and paint jobs for real-world bus companies if you want to bring a little extra realism to the experience. Bus Simulator 18 could do with a lot more polish, and someone desperately needs to proof-read the dialogue captions, which rarely match what’s being spoken. But, like most of these niche sims, I’m glad it exists. It’s given me a chance to experience, in some way, what it’s like to be a bus driver, and I never really considered how stressful the job could be. I think I’ll stick to Euro Truck Simulator 2, where I don’t have to deal with people and can drive for long stretches without interruption, but this is still a fun simulator, with an infectious enthusiasm for this most noble and misunderstood of professions.